Who is Brock Long, the government's point man in Houston? The man helping lead the federal government's response to Hurricane Harvey and the massive floods hitting coastal Texas is a well-respected emergency manager who was confirmed to his post earlier this year in a 95 to 4 vote. 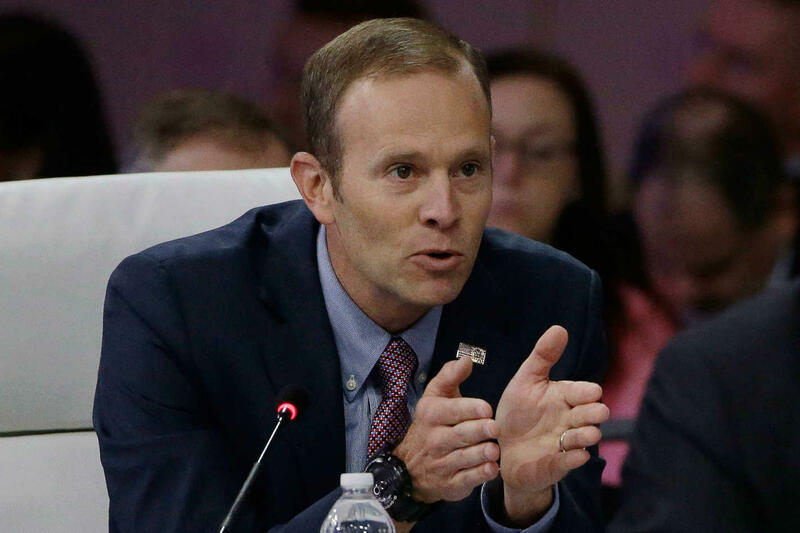 FEMA Administrator Brock Long has been a regular presence on the airwaves since the devastating storm made landfall on Friday. Houston as seen record floods since the storm began, and the situation is expected to get worse as the week continues, with fifty inches or rain expected in some areas by the end of the week. The storm has already left several dead. Long is widely respected in his field and has been working in emergency management for decades. "We couldn't have picked a finer leader," Tom Bossert, a homeland security adviser to President Trump, told NPR over the weekend. "He's had state director experience; he's had FEMA experience. He's absolutely the top of the top." President Carter started the Federal Emergency Management Agency in 1979 as a way to provide assistance to local governments hit with disasters that would otherwise overwhelm them. The powerful agency, which is now part of the Department of Homeland Security, typically enters the fray when a governor requests federal assistance during or in the lead up to a disaster. In accordance with the Stafford Act of 1988, once a request has been made by a governor, the president has the power to declare a disaster and send in FEMA. The agency then picks up most of the cost of protecting lives and rebuilding infrastructure. And FEMA does more than just respond to hurricanes – everything from tornados to earthquakes to terror attacks fall under the agency's purview. FEMA's administrator often becomes the public face of the relief effort. In 2005, FEMA chief Michael Brown was widely criticized for running the response to Hurricane Katrina, and shortly thereafter resigned in disgrace. At the time, President Bush was also criticized for appointing Brown, whom he famously called "Brownie" and defended as doing a "heck of a job." Brown had little experience in emergency management and had spent more than a decade as a top judge for the International Arabian Horse Association. The ensuing catastrophe in New Orleans, which was located directly in the path of the category-3 storm, diminished FEMA's reputation. President Obama's appointee to lead FEMA, Craig Fulgate, was credited with reforming the agency. Mr. Trump appointed Long to lead FEMA in June amid fears that the 2017 hurricane season could produce several major storms capable of making landfall in the U.S.
What did Long do before this? Brock Long has worked as an emergency manager in Georgia, worked at FEMA during Hurricane Katrina, and ran the Alabama Emergency Management Agency during 2010 BP oil spill in the Gulf of Mexico. He then worked in the private sector as an emergency manager before joining the Trump administration. Emergency managers who have worked for Democratic and Republican administrations alike have praised Long as highly capable. "He's got the relationships throughout emergency management, throughout the states," Barry Scanlon, a FEMA official under President Clinton, told NPR. "He has the respect of the people who do this every day, which is vitally important." "Brock brings both State and FEMA experience to the job," Long's predecessor, Fulgate, told Forbes earlier this year. "He knows the programs and challenges he faces." For his part, Brock said last month that he worried that the government had not faced the landfall of a major hurricane in more than a decade, which he said had the potential to create what he called "hazard amnesia." He said the government had failed to "build a true culture of preparedness in our citizens." "[O]ne of the things that keeps me up at night is this nation has not seen the devastation of a major land-falling hurricane since 2005. So sometimes I think we forget the worst," Brock told the National Governors Association last month. "We have not seen a devastating earthquake in some time. I go to sleep with that every night." What is Long saying about the current storm? Long has described the storm as an "ongoing situation" and said that FEMA is focusing on a "life-safety, life-sustaining mission" during a Monday press conference. He also said the agency was bolstering rescue efforts "over 30 to 50 counties impacted possibly in Texas." He added that some 30,000 people were likely to wind up in temporary shelters, a "very heavy lift." Asked by CNN's Jake Tapper over the weekend whether FEMA was prepared to be in parts of Texas "for months," Long replied that "FEMA's going to be there for years." He continued, "This disaster's going to be a landmark event, and while we're focused on response right now and helping Texas respond, we're already pushing forward — recovery housing teams, forces to be on the ground to implement national flood insurance program policies as well, and doing the inspections that we need. So, we're setting up and gearing up for the next couple years."